Gray flat file organizer. File organization suited for construction documents, design firms, engineering and more. Case-hardened, ball-bearing rollers for quiet operation. Positive closures and courtesy stops. Rear hood and hinged front depressor. Use organizer individually or in space-saving stack. 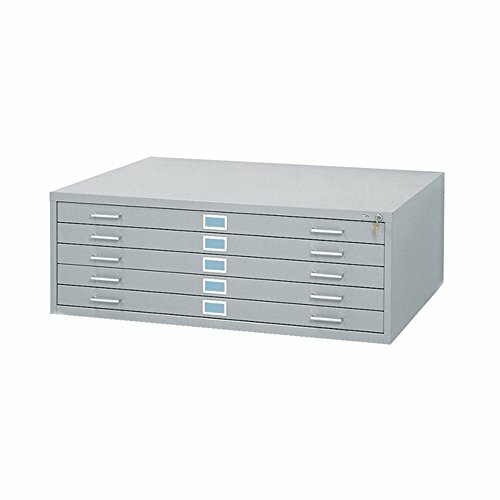 Five large-capacity 2 1/8" deep drawers - 46 1/2"W. Stores up to 500 sheets per unit active filing, 750 sheets of semi-active or 1,000 sheets of inactive material. Depth of File: 35 3/8" without handles. Distance Between Holes: Handles - 3 3/4" center of hole to center of hole. Overall Depth: 35 1/2". Overall Height: 16 1/2". Overall Width: 46 1/2". Drawer Dimensions: 43"W x 32"D x 2 1/8"H (inside). Label Holder Dimension: 3 1/4"W x 1 7/8"H (outside). Fits Sheet Size: 43" x 32", 30" x 42", 28" x 40". Material(s): Steel. Paint / Finish: Powder Coat. Recycled Content: meets or exceeds 25%, 0% post consumer. Stackable: Yes, up to 2 units on high base; 5 units on closed base. Greaseless Bearings: No. GREENGUARD: Yes. Lockable: Yes - lock not included. Material Thickness: 22 ga. (cabinet), 20 ga. (drawers), 16 ga. (drawer and cabinet glide). Water Resistant: No. Assembly Required: Yes. UPSable: No. Tools Required: Yes. Country of Orgin: US. BIFMA Rated: Yes. Capacity - Sheet: 500 - Active; 750 - Semi Active; 1000 - In Active. Color: Gray. Finished Product Dimensions: 46 1/2"W x 35 1/2"D x 16 1/2"H. Finished Product Weight: 192 lbs.